Year you started collecting: 2014 (Wow, has it really only been two years? It all started with my attending a book signing by my partner Chervis Isom). 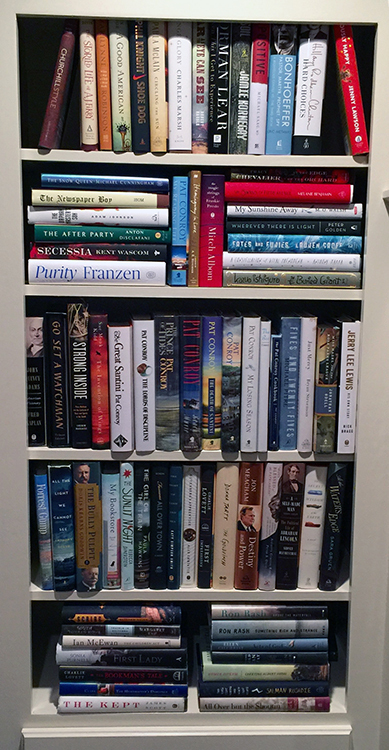 Shelving method (by genre, author, signed copies): I group by author when I have multiple books. Mostly it is random. Total number of copies: I probably have in excess of 500 books in my library. Total number of signed copies: 75 from Alabama Booksmith; probably another 10 signed from random places. Favorite treasure(s): Having most of Pat Conroy's signed. One of the discoveries I made at Alabama Booksmith is Ron Rash, and now have half a dozen signed books of his. I think that most of the monthly selections from the Alabama Booksmith have become treasures including The Invention of Wings, All the Light We Cannot See, The Secret Life of A.J. Fikry and The Sunlit Night. Favorite part of having signed books: having a signed first edition somehow personalized the book and the reading experience.